Chalkboard stuff is totally in right now. Or maybe it's on its way out and I'm just behind. That's a good possibility since I've been seeing chalkboard all around for a while now. 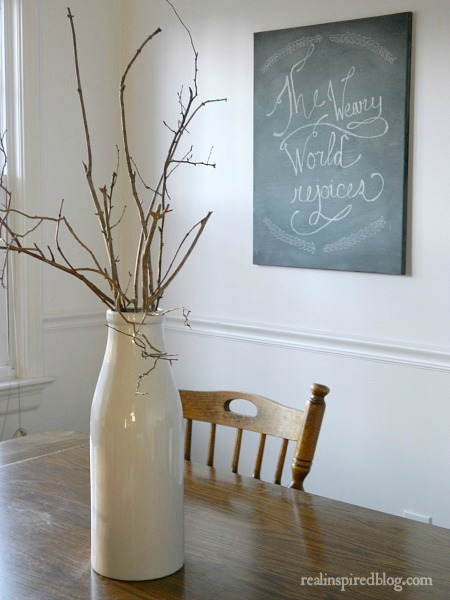 Chalkboard walls, framed chalkboards, chalkboard jars...all super cute! 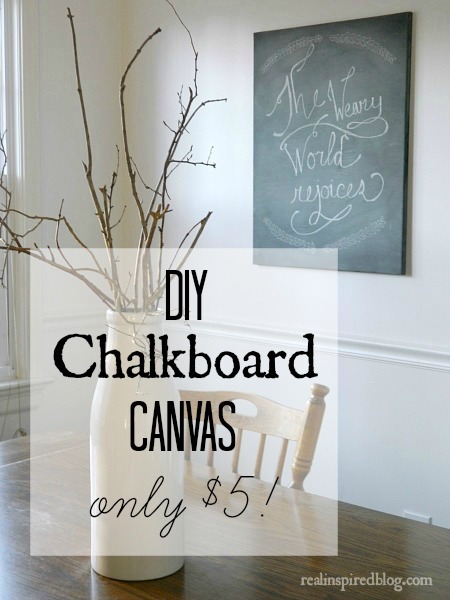 It's very easy to make anything into a chalkboard with a little bit of $3 chalkboard paint! I have a few little chalkboard things here and there, but nothing big. Pretty much all our walls are textured so no chalkboard walls, and I haven't tried turning a big picture frame into a chalkboard because I'm accident prone and clumsy. Moving a giant, heavy piece of glass around to paint just sounded like a bad idea. Seriously, I scare my husband when I use kitchen knives. My other option was a regular old art canvas. Buying an art canvas at a craft store can be pricey, especially for the larger ones, but if you rummage around at thrift stores enough you will find a few here and there. 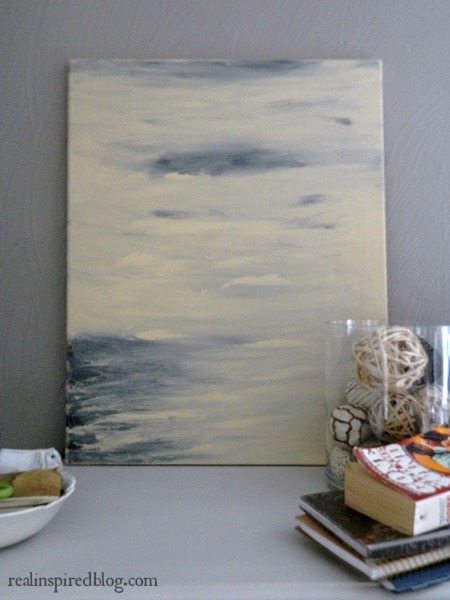 Most thrift store canvases are rather ugly so I don't feel bad about painting over them. I found the above canvas at Goodwill for less than $3. It wasn't too ugly and I actually liked how the colors were used, but I wasn't a fan of the yellowy cream color. 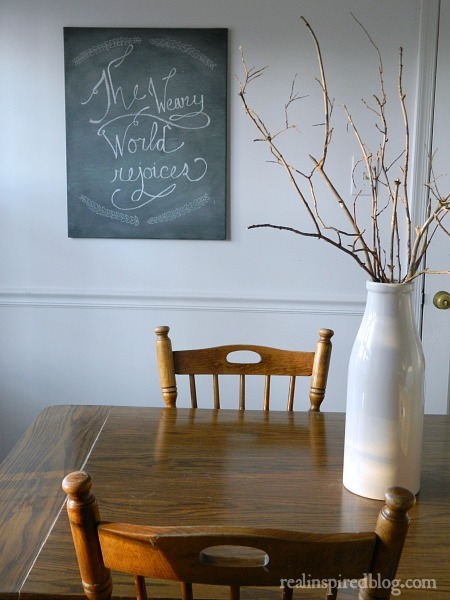 It sat around the house for a couple months until it hit me: chalkboard spray paint. To prep my canvas for painting, I ran a damp cloth over it to get any dust off. I didn't sand it, but I would recommend it if there are any really big blobs of paint on it, or if you just want a much smoother surface on which to use your chalk. I ignored the big blobs of paint on mine and just went straight for painting after letting the surface dry. After prepping, I sprayed on two coats of Rust-Oleum 1913830 Chalkboard Spray, Black, 11-Ounce . Chalkboards have to be seasoned before they can be used so, after the canvas was dry, I rubbed the side of a piece of chalk all over it then wiped it all off. Chalk dust everywhere! You may have seen the finished project already in my Christmas Tour. About $3 for the paint and $2 for the canvas gave me a nice little chalkboard for $5! I love how it turned out! Hubby thought I'd done gone out and bought something again. It totally had him fooled!